The methodology described in this post represents the backbone of our sales and marketing services for MSPs. If you'd like to discuss, then don't hesitate to book a meeting with Derek. Growing an MSP profitably isn’t easy to do alone. Of course, with enough cash, any MSP can "grow" with enough advertising or via acquisitions, but most MSPs don’t have either luxury. And, let’s be honest, advertising and buying companies doesn’t automatically translate to profit. Lots of MSPs depend fully on referrals, but once referrals dry up, they struggle to meet new leads. After referral dependence comes the cold-calling. The mistake is that if the calls aren't part of a wider multi-touch plan that spans over weeks, and that doesn't come across as robotic or purely self-serving to the people on the receiving end, it's very hard for MSPs to get much with cold-calling. 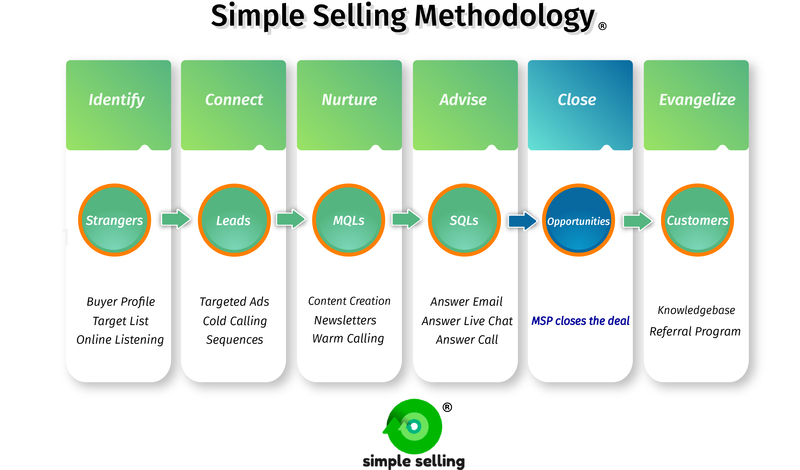 Bearing the previous challenges in mind, Simple Selling’s methodology was developed to help the up and coming MSP overcome all of these struggles. An MSP that wants to grow steadily and be profitable too is the kind of company this methodology is built for. An MSP that wants net new recurring revenue clients and retention rates of 100% or greater for at least 36 months or longer will like this approach. Most importantly, why do we believe our framework is great? Because unlike other popular frameworks, ours takes MSP’s unique goals, challenges and opportunities into account in each of the phases. Buyer Profile - Deciding on the ideal client is a big decision and a necessary one because it makes marketing and sales focused. Marketing can dive deep into content and messaging that truly resonates with a "Manufacturing company of 10-50 users." And sales can target the right companies too and develop talking points, stories and examples that make your MSP come across as true specialists. Target List - Since MSPs know their target market in a profile sense and in a geographical, we can come up with a list of companies to "go after." We need targets and this is a simple but important step that often gets overlooked. Online Listening - We need to keep our eyes and ears open for opportunities. Compelling events, such as "company moving locations" or "competitor receives a negative review," present green lights for us to reach out to a company. Targeted Ads - If a company urgently needs computer repair, they will search on Google for a local IT company, right? So we use Google ads to catch these fish. In addition, direct mail to the companies on the target list and targeting them on LinkedIn may be appropriate, too. Cold-Calling - We need to be aggressive. Not annoying or pushy, but determined to make a connection with our target market. With good messaging and timing, we can get companies to listen for a few minutes. For instance, calling a company after we've sent them a letter, or calling if we read an article about them opening a new office is good timing. 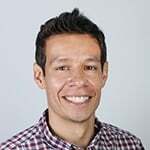 Sequences - We can't expect that phone calls are enough, we need to try other means like emailing and LinkedIn connects to make engagement possible. We create automated sequences that span over 6 weeks to ensure we get to "Yes", "Thanks, maybe later" or "No." Content Creation - Blogs and videos are a means of showing thought-leadership. Guest blogs on websites in your target area are also great opportunities to get in front of audiences. Newsletters - This is the shipment of the blogs and videos to our target market. It can be via direct mail, or in most cases, an email newsletter. The bottomline is that content we make is only helpful if potential clients see it. Warm-Calling - Yes, we keep calling at this stage if the company gave us permission to. For instance, if they said to us "call us back in 3 months" then we set up a reminder for ourselves to call back. Can't let these opportunities slip! Answer emails, calls and chat - If we do a good job in the previous phases, then these companies will come to us when the time is right. They will visit our website and strike a chat, email questions about services and even call even. We are advising them on the right solutions here, being helpful and honest about how we can help them. MSP closes the deal - If a company we speak with during the previous phase decides that it's time to move forward with an IT assessment, or if they simply have a question that we can't answer but you or your technical team can, then here's where we hand off the company to the MSP to close! Knowledgebase - Beyond IT pain points, your clients have lots of questions related to technology, sales, marketing and if you can be their resource for this kind of knowledge, they will appreciate it a lot. Referral Program - Referrals will remain an important source of new business, but letting it happen by accident is a mistake. Instead, create incentives and reminder for clients to bring you more business. It's a worthwhile investment, even it's mainly automated.